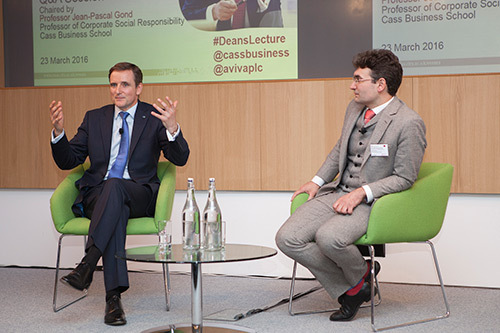 Cass welcomed Mark Wilson, Group Chief Executive Officer of Aviva plc to give the Cass Dean’s Lecture. Cass welcomed Mark Wilson to give the Cass Dean’s Lecture. His title, ‘Being a good ancestor: Looking Long-Term, Building a Sustainable Business and Creating Legacy’ called upon his extensive experience and knowledge of the insurance sector. Professor Marianne Lewis, Dean of Cass Business School introduced Mark, saying, “Mark has an excellent track record, it’s a great opportunity to hear first-hand from high profile individuals at the very top of their profession”. Mark Wilson first became a CEO aged just 28, and he has enjoyed a long career in the insurance industry. Before becoming Group Chief Executive Officer of Aviva plc in 2013, he spent 14 years in Asia working for AIA Group (Insurance) and AXA China and AXA South East Asia. Wilson described himself as a “mix of architect, engineer and businessman…I’ve built my entire career on fixing things”. On being a good ancestor, Mark said, “My role as a CEO is often to simplify and kill that complexity; to boil stuff down and sort out the things that absolutely must be addressed. (As CEO) I think you’ll only make several big decisions a year – maybe its strategy, perhaps it’s M&A? More likely it’s about people". “But if you want to be a good ancestor as a CEO you’ve got to make the tough calls. If your desire is to be loved rather than respected, then you will fail, because your decisions will be wrong and based on your need to for constant approval". 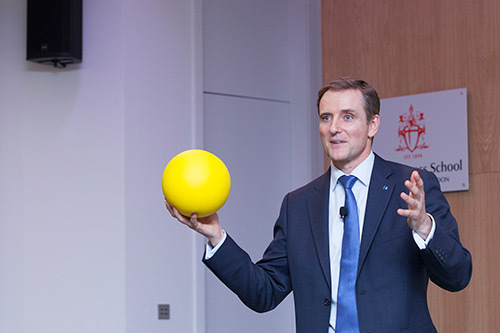 Mark added, “In your organisation, you’ve got to set the business values that you demand from your people and at Aviva we hire based on those values. Our values are purposefully edgy and provocative. The first value is ‘create legacy’ which is simply being a good ancestor. The second is to ‘care more’, which basically means do the right thing. The third value is ‘kill complexity’; as business, as an industry, as a country, we like creating rules. And, the last value is ‘never rest’. Never be happy with the status quo". He concluded, “My favourite word in any language is a Maori word called mana and its mean is impossible to capture in a single English word. It encapsulates earned authority, prestige, courage and humility. In relation to business leadership, mana in action means teams have to work for the team, not for the individual; otherwise the organisation becomes infected by hubris and it’s a trait not unfamiliar with CEOs. As CEOs we all need to guard against this". You can read Mark's full speech here. Follow all of our Dean's Lectures on Twitter using #DeansLecture.